With more than 20,000 restaurants in NYC there’s no shortage of competition. What makes one place more popular or last longer than another? It all starts with using quality ingredients and providing great customer service but what then? I’ve learned it comes down to one thing; stick to your guns. If you’re opening a restaurant and you have a great idea, don’t give up. Doesn’t matter if you’re the first or the latest business to do it, do it better and don’t stop. A perfect example: Back Forty. Back when Peter Hoffman started the now defunct Savoy, in the early 1990s, there wasn’t a whole lot of farm to table dining happening in NYC. Now, more than 2 decades later Peter is running two of the most popular green-oriented restaurants in the city, Back Forty and it’s sister (in the ex-Savoy location), Back Forty West. The greenmarket oriented restaurant in the East Village, according to the owners, is just a Burger joint. A Burger joint that’s “an organic and responsibly sourced one, with ample, in-season vegetarian dishes.” While the menu is short and the restaurant is short on decor, the simplicity of these aspects is overridden by the intensity of the Food, Cocktails and Craft Beer served. Menu items change nightly and there are always special events, like their summer Crab Boils but there is one thing always constant, Back Forty’s Grassfed Burger. This Burger has been on my “to eat” list for sometime so when fellow Wing-Off member JD and his wife asked me and my wife out to eat in the East Village, I knew it was time. My meal started off with the restaurant’s name sake, the Back Forty. 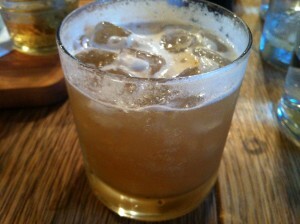 It’s made with George Dicke # 12 Whisky, Maple, & fresh Lemons. It’s a nice balance of smokey, sweet and sour flavors that will definitely make you want a 2nd one. My newest Food obsession is Pickled Veggies, although not Pickles themselves, so when I saw the Back Forty Pickle & Cheese Board, with 10 daily selections of Pickled Veggie’s & Cheese, I had to have it. 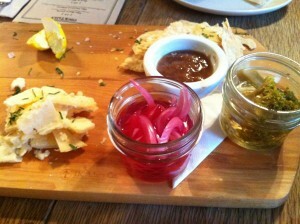 I LOVED the Pickled Onions mixed with the strong White Cheese. The just slightly hot and sour Chutney was great too and let us know we were not in for a meal of weak flavors. 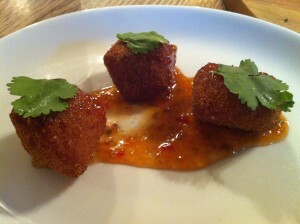 Only one more dish before the Burger moment happened and that was the Pork Joel nuggets. I wasn’t really into these but then again, I don’t eat face or neck. It’s a rule. I know people love Pork cut from above the neck but I find it fatty and a flavor I don’t enjoy as much as the rest of the Oink. While JD and I both ordered the Burger, the idea was that we would all share plates to have our own version of a menu sampler. 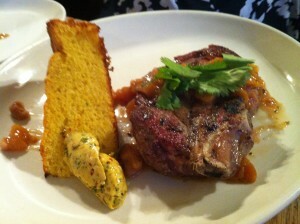 Pork Chop Special: Awesome. Cooked a little on the pink side and made with roasted Peaches, it’s tender, succulent & juicy. All the flavors are very subtle and the Peaches, the Peaches are worth eating on their own. This is how pork tastes in my mind. 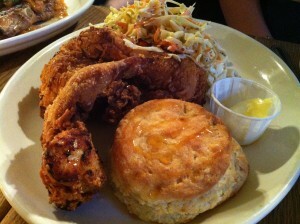 Fried Chicken: Great crispy Skin on the outside that was flaky, rich, buttery and savory with a very juicy Meat inside. The skin has just a hint of sweetness perhaps from a little Brown Sugar. It comes with a flaky, buttery, soft, rich, delicious and nearly perfect Biscuit. It’s only served on Mondays and worth making that the day you eat here. 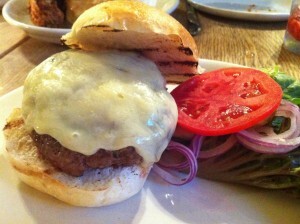 Grassfed Burger: This is it. This is the item that gets the people squeakin’ and the reason you’re reading this post. It comes with a Spicy Housemade Ketchup & Pickle with options to add Heritage Bacon or Farmhouse Cheddar and a side of Rosemary Fries. 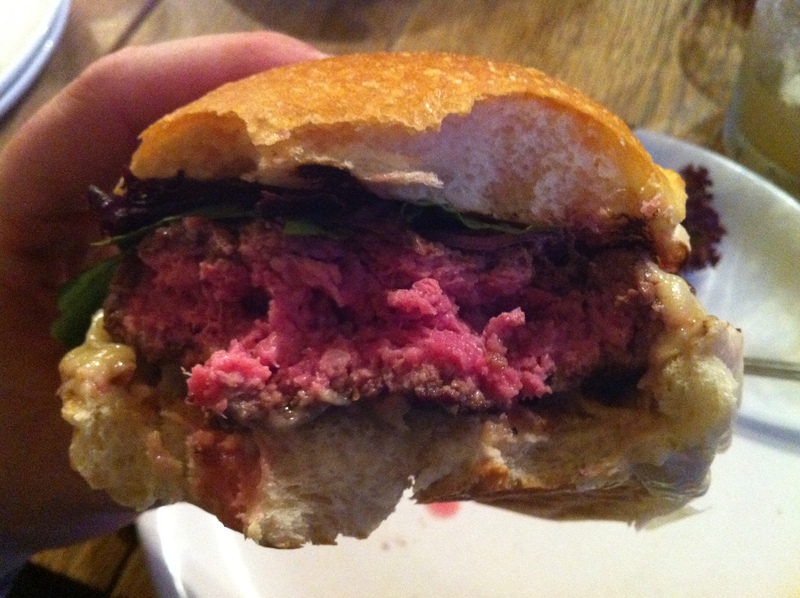 The Burger had an all natural beef taste and cooked a little more on the rare side of medium rare. Be careful if that’s not what you are used to. I’d suggest ordering based on a description of how you want it to look based on color. Even though it’s a hearty sized Patty, I thought the bun was just a little too, ummm…Bready. The Greens are really fresh and the Cheese is an absolute must. After trying a bite of JD’s I realized I made a huge mistake by not ordering the Burger topped with Bacon. It’s a really good Bacon that’s smoky and not fatty, not too crispy and all delicious. Overall, it could’ve used a little more seasoning, even Salt and Pepper but still a very solid Burger. The Burger at Back Forty is the reason people come, the Fried Chicken and Biscuits is a reason to come back. Back Forty scores a 7 on The Rev Meter. This entry was posted in Bar, Beer, Burgers, East Village, Gourmet Burgers, Hamburgers, New York and tagged "farm to table", "fried chicken", back forty, best burger nyc, burger conquest, cheese, ciancio, east village, East Village, french fries, grassfed, hamburger, new york, ny, nyc, peter hoffman, rev, review, savory, the rev meter for social community. Bookmark the permalink.